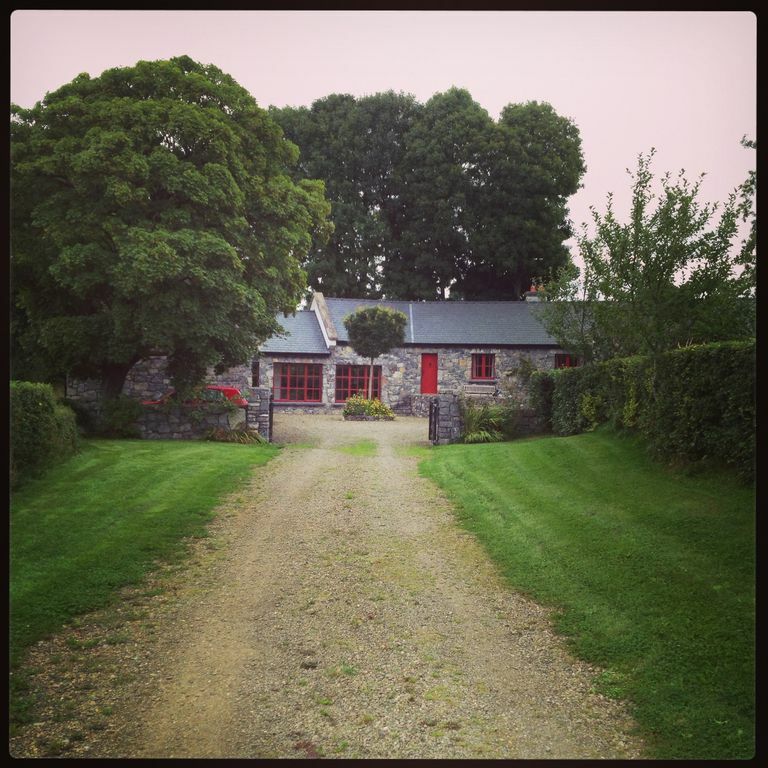 Our home is located in the heart of the Galway countryside just five miles from the bustling town of Portumna. The cottage itself has been lovingly restored using stone from the original cottage and its outbuildings. The rooms are large and spacious and tastefully decorated beneath individually crafted beamed ceilings. There are multiple outdoor seating areas including a private garden with French doors off of one of the bedrooms. Water is filtered and softened. We also just installed an in the ground 14' trampoline. There is a tire swing and wooden house in the back garden for the kids. Shop. Pub. Restaurant 5 miles. Beach 43 miles. GF: lounge, kitchen/dining, utility room, conservatory, 2 Queens, 1 double, all with ensuite bathrooms. Electricity by meter read, linen and towels included, internet access, travel cot, satellite TV, DVD player, radio, CD, freezer, freezer, dishwasher, under floor heating, w/machine, dryer, fully enclosed garden, patio area, sitting out area, garden furniture, barbecue, private off road parking. No Smoking. This property is extremely child friendly and has everything available that you will need to entertain children. Please see our web site for more photos and details-address is below. HORSE RIDING Two nearby equestrian centers offer riding for all levels. For the beginner and children there's pony trekking available on a working farm. For the more advanced rider there's an equestrian centre providing cross country jumping, and pre-hunt training. Cross country and show jumping clinics as well as intensive training weekends are also available here. Hunting can be arranged during season with four local hunts. FISHING Pike and Trout fishing on the River Shannon (10 minutes away) by bank or boat. Guides and boats are available. Carp fishing 20 minutes away at a private lake. CLAY SHOOTING A five minute drive away. Down the line trap, spring and teal, rabbit and pheasant, overhead tower traps. Supervised gun lease. GOLF There are many courses within a short drive. All are open to non-members upon payment of a green fee. KARTING Pallas Karting is Europe's largest karting centre. Two different tarmac tracks, one for beginners (500 meters) one for more advanced (1,500 meters). Both tracks are approved by the Royal Irish Automobile Club. WATER SPORTS Power boating, paragliding, water skiing all available on the River Shannon 15 minutes away. BOATING self-drive motor cruisers can be rented in Portumna for use on the Shannon. WALKING Close by in Portumna Forest Park, on the shores of Lough Derg, taking in Portumna Castle and Monastery. TRADITIONAL IRISH MUSIC At the Derg Inn in Terryglass â€“ 20 minutes away. Also at various other local pubs and festivals in the surrounding area. FURTHER AFIELD . . .
GALWAY CITY Under an hour away. This city is thriving with arts and culture. CONNEMARA Breathtaking scenery and beaches, completely untouched for hundreds of years. Village of Cong where 'Quiet Man' was shot. About 1 1/2 hours from the house. BURREN Home of the Cliffs of Moher and the beautiful rugged stone landscape, unique to this part of the country. Great beaches can also be found here. SLIEVE BLOOM MOUNTAINS Hill walking among miles of forest and natural bogland. One hour from the house. BIRR GARDENS Reported to be the best gardens in Ireland, the grounds of Birr Castle are truly impressive. Horse riding, Pony trekking ¼ miles. Walking 1 mile. Traditional Music, Shooting, Leisure Club with gym, hot-tub, sauna, steam room, Children's Playground, Fishing, Golf, Forest walks 5 miles. We live and work in New York City but fell in love with Ireland on our first visit 10 years ago. Each summer, we visited different areas of Ireland and went on various horse riding holidays. We fell in love with the small village of Gortnacooheen just outside of Portumna. We built this house from the stone that remained from the original buildings on the site. We built it with the idea of one day retiring here. Each year, the garden develops more and each year, we love it more. We hope you will come visit. Absolute luxury with softened filtered water, High end, imported furnishings, linens and cookware. You won't find another house like it. Each bedroom is en suite. We can arrange delicious home cooked meals and housekeeping at an additional charge. This property is absolutely beautiful and enormous. It is a short drive from town, tucked discretely just off the road and with a huge garden. We have small dogs that couldn't be let off the lead as they could escape in the hedges but we managed that problem with the use of long training leads. The layout affords great circulating space and privacy which is so difficult to achieve. Mary is there when you need her and unobtrusive when you don't. Beds are very comfortable, bed linen heavenly. A few more plates, tea spoons and bigger glasses wouldn't go amiss but this is such a minor thing. There are pots galore and an irritation in other rentals is scarcity of loo rolls, washing up liquid etc but that's not an issue here. We definitely hope to be back. We felt at home so quickly and would love to repeat the experience. A really great find with an excellent layout, exceeding expectations. Everything you could ask for and more! We (2 couples) stayed at the stone cottage recently. It was at the end of our stay in Ireland, and was by far the best accommodation we experienced. Spacious doesn't come close to describing how roomy it was, yet it was cozy and comfortable. The small town of Portumna was just big enough to provide basics, but not overwhelmed with tourists. We took trips every day of our stay: to Galway, the Connamara, Athlone, Birr and more. There is a golf course for those inclined to do that activity, plus a lovely nature walk as well. A castle and Irish workhouse is also in town. The caretaker was helpful and warmly welcomed us to the cottage. We would definitely recommend this home! We loved this beautiful stone cottage! It had all we could need for our stay in the beautiful Irish countryside. Very well appointed, clean and well managed. We would love to return someday. We stayed for 7 nights with another couple in this home and it absolutely fit the bill. We used it as a base camp and did day trips to Cliffs of Mohr, Waterford and Gallway. The home has all the ammenities you could want and Mary Rourke was so helpful and friendly. We even found a private boat that took us on the river Shannon for a couple hours and left right from Portumna which was really great. Thanks for making our first trip to Ireland a memorable one! I have been renting through VRBO for five years, averaging six stays per year. Of all my experiences, this home in reality was the closest to its description. It's exactly as it appears in the pictures and has a lot of high end touches you rarely see in Ireland. It has radiant, in-floor heating and most of the rooms have individual controls. The main setting which controls the kitchen, dining & living room is housed in a locked box on the outside of the home - so this needs to be changed by the caretaker, Mary. All of the other rooms have their own controls, so you choose your comfort. The kitchen appliances are all high end and have the manuals in a binder to assist you. I would like to note the home is accessible - it has a ramp at the entrance, two bedrooms, two baths (with roll-in showers), the kitchen & dining room all on the same floor. The rooms are gigantic and the hallways & doorways are wide. The living room (TV & fireplace), sun room and the master suite are located up three stone stairs, however. The house is also suited for families with young children - it has several board games, a toy house, blocks, etc. The stove has child lock measures for safety too. The house is also suited for groups or families with teens as the master bedroom is on the complete opposite side of the house as the two other bedrooms. And every bedroom has it's own en suite bath, so privacy is amazing. The only FYI's that should be noted are: 1) You are in Ireland on a wooded lot, so expect to see a few spiders/bugs (especially in the fall or winter as Ireland is notorious for its spiders during these seasons). 2) The microwave's timer does not work - you set it for a specific time, but it doesn't count down, it just keeps running. So don't set it and then walk away expecting the *ding. * 3) The shower temperatures are a little touchy. If you find the water isn't hot enough, I recommend shutting it off, turning the temperature knob to a hotter setting & then turn it back on. For some reason it wouldn't get hotter once it was on. 4) It is a self-catering house, and when I was there it didn't have some things you would think may be there - like black pepper & sugar. Just be prepared to look around the kitchen before you head to the store. 5) The fireplace doesn't emit a lot of heat, I think the chimney is a little too large and the heat escapes up it. So don't invest in a lot of firewood or peat logs unless you just want the ambiance. It was wonderful to come"home" to Stone Cottage after a day of sight seeing! We could relax by the fire. We enjoyed cooking a few meals and playing cards. The property was beautiful! Portumna was just a short drive to do some grocery shopping and we enjoyed a few pubs! Our time in Ireland was GREAT ! Utilities are by meter reading and can be paid at check out to our caretaker.